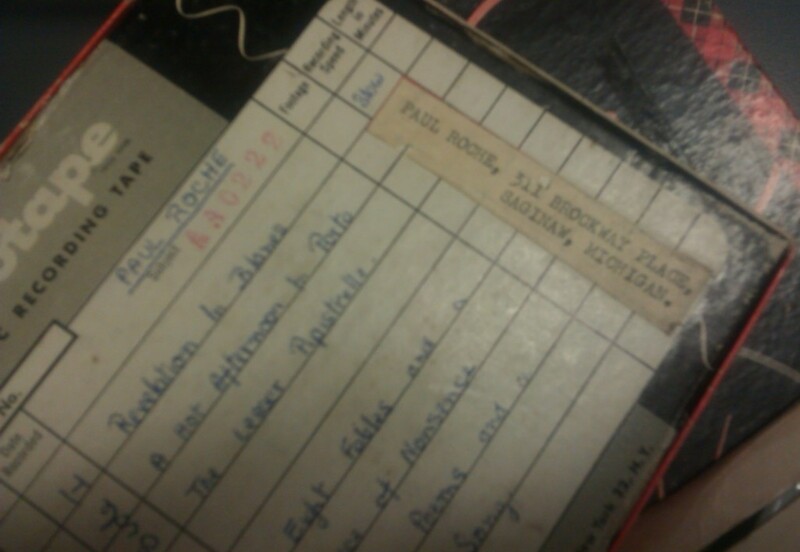 Last week we wrote about the person time involved in transferring magnetic tape to digital files, and we want to tell you more about the processes involved in digitisation work. While in theory the work of migrating media from one format to another can be simple, even the humble domestic cassette can take a substantial amount of time to transfer effectively. Doing transfers quickly would potentially keep the costs of our work down, but there are substantial risks involved in mass migrations of tape-based material. Problems with digital transfers can occur at two points: the quality of the playback machine and the quality of the tape. First, lets focus on the playback machine. 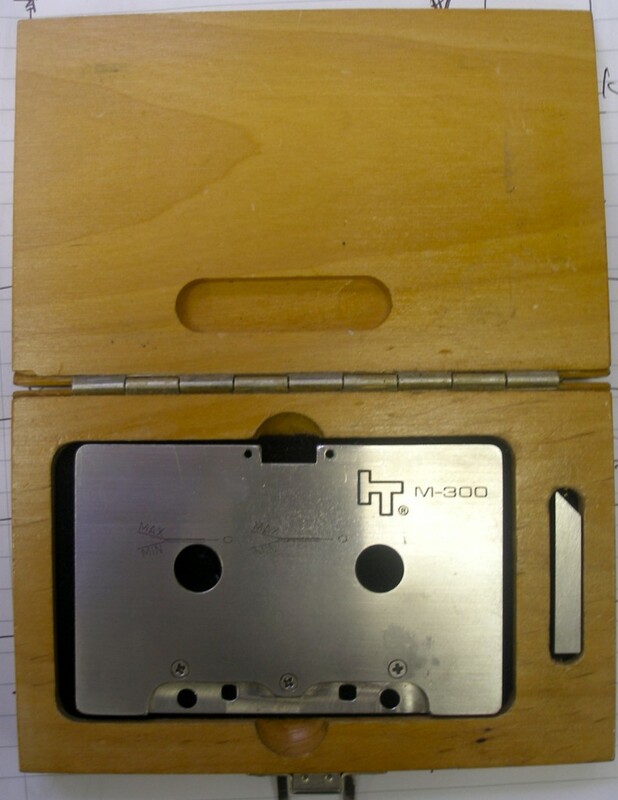 Each time a cassette is transferred we have to ensure that the cassette deck is calibrated to the technical specification appropriate to that machine. Calibration is a testing procedure where a standard test tape is used to set the levels for tape to be digitised. The calibration process allows us to check tapes are played back at the correct speed and audio levels, that wow and flutter levels are set and the azimuth is aligned. 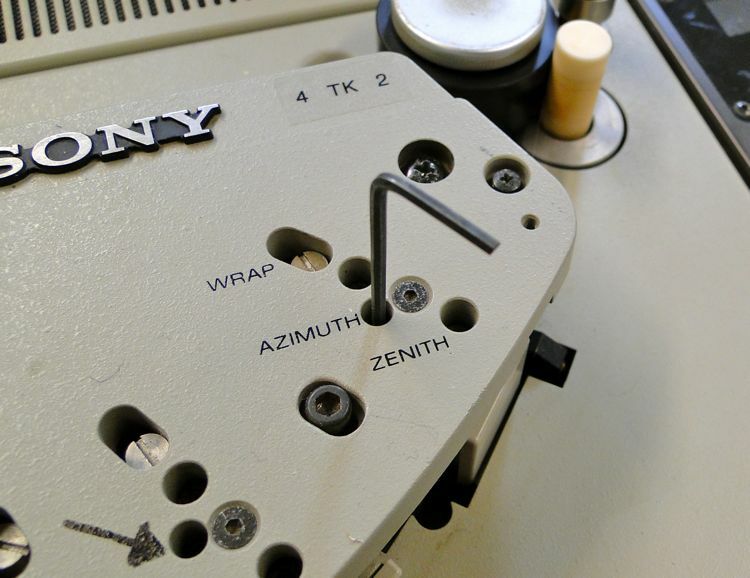 Azimuth refers to the angle between the tape head(s) and tape. Differences in Azimuth alignment arise from the azimuth of the original recording. You cannot know this information from just looking at a tape and you will get a sub-optimal transfer unless you adjust your machine’s azimuth to match the original recording. Regularly checking the Wow and Flutter on the tape machine is also very important for doing quality transfers. 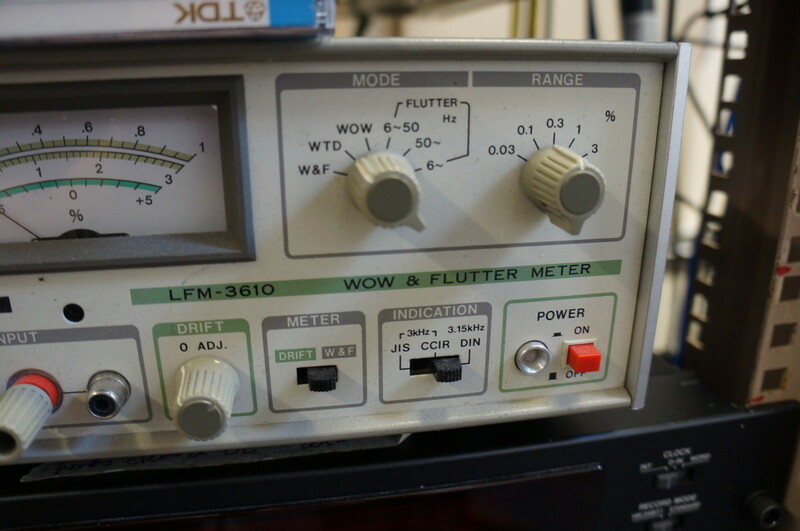 Wow and flutter refer to fluctuations in speed on the playback mechanism, flutter being a higher rate version of wow. If you have listened to a tape you will probably be familiar with the sound of warped and woozy tape – this is the presence of wow. All tape machines have wow and flutter, but as components in the mechanisms stretch there is the potential for wow and flutter to increase. It is therefore essential to know what level the wow and flutter are set on your tape deck –less than 0.08% Weighted Peak on our Nakamichi 680 machines – to ensure optimal transfer quality. Not all cassette machines were made equal either, and the quality of playback is absolutely dependent on the type of machine you have. There is a massive difference between the cheap domestic cassette machines made by Amstrad, to the cassette decks we use at Great Bear. Nakamichi machines were designed to squeeze the most out of the cassette, and their performance is way above the standard ‘two head’ cheap domestic machines. Even with a Nakamichi deck, however, they have to be regularly checked because they are fragile electromagnetic machines that will drift out of specification over time. When machines drift they slip out of alignment, therefore effecting their operating capacity. This can occur through subtle knocks, everyday wear and tear and general ageing of mechanical and electrical components. For example, with extended use the grease in the components dries up and goes hard, and therefore affects the movement of the mechanisms. Problems can also arise with the tapes themselves. Most issues arise from tapes not being played back in well calibrated machines. With audio cassettes the potential for azimuth error is increased because the speed the tape moves pasts the head is very slow. The tape therefore needs to be assessed to see if it is in a playable condition. It is played back in mono because it is easier to hear if there are problems with the azimuth, and then the azimuth is manually adjusted on the machine. Migrating tape is unquestionably a ‘real time’ process. You need to listen and monitor what’s on the tape and the digitised version to ensure that problems with the transfer are detected as it is happening. It is a very hands on activity, that cannot be done without time, care and attention. Cassette decks when they left the factory or a service centre should have been aligned to a standard reference for the position of the record and play heads. Unfortunately they often weren’t all the same and over time the alignment can get drift, get knocked out or manual ‘fiddled with’ by an owner. What this means is that unless you’re playing back your tape on the machine it was originally recorded on you may be getting the maximum quality as the angle of the head to the recording or azimuth will not be optimal. Without calibration tones recorded at the start of the tape which is very unlikely on most domestic cassette tape recordings you must set the playback azimuth manually. A few high end tape decks, namely those made by Nakamichi, either had a easily accessed Azimuth adjust or could even automatically adjust this throughout the tape. The Nakamichi Dragon was one such tape deck and could be the best, if working well, for high quality playback. Look at the tape path (everything the tape will move across) and if it looks brown and dirty get some isopropyl alcohol and give it a good clean with a cotton bud. If you haven’t demagnetised your deck for a while now would be a good time to do it..
Power up your cassette deck, which hopefully works correctly and doesn’t have too much speed instability! Pop your tape in the cassette well and start to play. Turn your amplifier’s volume up and if you can put it in Mono. Now, look under the tape machine’s playback or combined record and playback heads you should see a small screw or nut possibly with anti tamper paint on it. Using an appropriate tool, turn this nut or screw a little left or right while listening to the audio. You should hear the recording, especially if it has a lot of high frequency content such as cymbals etc get bright and dull sounding or more technically get more in or out of phase. Your aim is to get the most in phase or bright sounding playback. Sounds better now?? Great, start to record using you favourite computer audio software. We like SoX for the control but there’s a huge range out there.